When the democratically-elected President of Ukraine Viktor Yanukovych was overthrown in the bloody US-backed coup of February 2014, turning Ukraine against Russia, one of the beneficiaries was Ukraine’s ‘anti-Russian church’: the Ukrainian Orthodox Church – Kyivan Patriarchate (UOC-KP). This church was established in 1992 by a former Metropolitan of the Moscow Patriarchate, Filaret (Denisenko), after he failed to be elected Primate of the Russian Orthodox Church (ROC). This caused him to break entirely from the church and create a new one in Ukraine. Later in 1995, when the elected head of this new church died, Filaret declared himself Patriarch of the UOC-KP. Today, the intensely anti-Russian post-coup Ukrainian Government is allowing Filaret’s clergy to lead their congregations in raids to take control of the churches and other facilities of the original Ukrainian Orthodox Church (Moscow Patriarchate, UOC-MP). Furthermore, Filaret’s speeches are openly hostile toward residents of the far-eastern Donbass region of Ukraine, where over 90% of the local population had voted for the overthrown President, and then refused to accept the coup-regime and thus declared the breakaway republics of Luhansk and Donetsk. He attributes their suffering not to the bombs and bullets coming at them from the post-coup Government, but to their “proletariat” leanings and their lack of suitable religious faith. Living near the Ukraine-Russia border, the majority of those people of course traditionally belong to the UOC-MP, but Filaret damns Donbass residents as being “atheists”, therefore siding very clearly with the Government that’s bombing them. Another recent headline was Filaret Leads a Procession of ATO (military servicemen and volunteers engaged in fighting against the residents of Donbass region), in which he openly sided with the killers of Donbass residents. In contrast, the UOC-MP, a self-governing Church in spiritual unity with the Moscow Patriarch, adheres to a neutral peacekeeping position regarding the conflict in Donbass. For that reason the Primate of the UOC-MP, Metropolitan Onufriy, faces harsh criticism from the warmongers but remains widely respected by people on both sides of the frontline. Because of this, his mediation has repeatedly contributed to the release of captured Ukrainians. For example, among his achievements has been the swap in December 2017 when, at his request, more than 200 prisoners on both sides were exchanged. In return for its support of the post-coup nationalist rhetoric, the Ukrainian Government openly favors the Kyivan Patriarchate, which is effectively a church of Russia-haters. Continuing a policy of ‘de-Russification’, which has already affected the cultural sphere, the authorities want to oust the UOC-MP from Ukraine altogether and create a single loyal Church based on the Kyivan Patriarchate. With the connivance of local officials and the support of nationalist groups, the Kyivan Patriarchate has been seizing UOC-MP churches, accusing its clergy and followers (whose numbers are three times larger than those of the UOC-KP) of ‘non-patriotism’ and ‘treason’. However, such politically-biased and unchristian behavior of the UOC-KP clergy has so far largely served to deter believers from Kyiv’s ‘National Orthodox Church’ project. President Poroshenko openly demonstrates his new religious preference (until 2014 he was an active follower of the UOC-MP). Officials at various levels and the media have accepted and broadcast the regime’s guideline, according to which the UOC-KP is the ‘legitimate‘ Church, while the UOC-MP is ‘the Kremlin’s agent‘. In 2016, Poroshenko and Ukrainian deputies sent letters to Patriarch Bartholomew of Constantinople asking him to recognize the Kyiv Patriarchate as a legitimate Church. Over the last couple of years, new bills have been introduced which would oblige the UOC-MP to change its name and coordinate its appointment of hierarchs with the state, while restrictingUOC-MP priests from preaching among believers in law enforcement and security agencies. Despite there being no formal procedures for determining church membership in communities, churches are also being obliged to switch denomination on the basis of simply declaring majority support among a church’s following. The next day, members of ‘C14’, a Ukrainian neo-Nazi organization that has direct links with the Ukrainian intelligence agency SBU, broke into the offices of the Union of Orthodox Journalists news agency in Kyiv, attempted to set fire to the UOC-MP’s Monastery of the Tithes, then painted slogans on its walls and cut down an information stand. The police took no action to stop the intruders. Although an investigation was opened concerning wilful destruction of the monastery’s property, the resulting impact on its journalistic activities was ignored. Two men were detained for causing damage to property and were potentially facing up to 15 years in prison. On January 27th, the court imposed a restraint – two months of arrest, or bail of €66,000 Euros. It’s known that the judge presiding over the case was pressured with threats of violence against her family. On February 5th, the C14 thugs were released following the intercession of several parliamentarians. The C14 organization claimed that the arsonists were bailed out by Rada deputy Igor Lutsenko and that the prosecutor had insisted on placing them under house arrest. Additionally, on January 11th this year, a regional Prosecutor’s Office opened a criminal case against an UOC-MP priest who refused to break Church rules and perform a ritual on a tragically deceased baby who had been baptized by a priest of the UOC-KP. 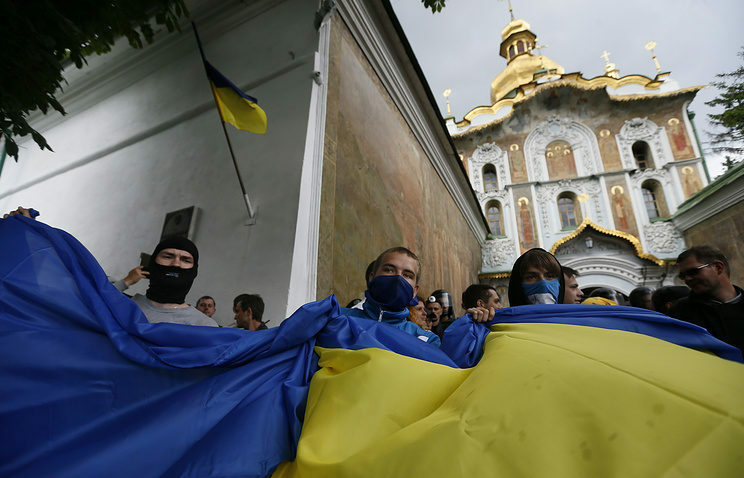 Thus, the Ukrainian authorities – in addition to their dilettante accusations, appeals to ban the UOC-MP, granting preferences to the Kyivan Patriarchate, and pandering to raider attacks on churches – are also interfering in the ritual activities of Ukrainian religious organizations. The Kyiv Government is intervening in the religious sphere at the international, national and local levels, regardless of the law or common sense. The authorities of the new ‘European Ukraine’ seem to be guided by the Peace of Augsburg Treaty (1555) and consider it legitimate to dictate to their vassals and subjects which faith they must profess. Moreover, they violate the right of members of the ‘wrong’ confessions to profess their religion, as enshrined in the Treaty of Westphalia (1648). The principle of the Augsburg Settlement, Cuius regio, eius religio (“whose realm, his religion”), became obsolete as early as the 18th century, after being one of the causes of the Thirty Years’ interfaith war, which brought death and ruin to Europe. But it’s the 21st century now, and there are international human rights documents – for example, the EU Guidelines on the Promotion and Protection of Freedom of Religion or Belief. However, Ukrainian authorities apparently reject modern democratic legality, even telling Europe that the principles of the Peace of Augsburg should once again be in force, depriving people of freedom of religion. For example, a member of the ‘People’s Front Party’, Viktor Yelensky, is calling for European institutions to ban certain “politicized” representative offices of religious organizations, specifically those representing or having ties with the Russian Orthodox Church (ROC). His rationale for thereby depriving people of their freedom of religion is that the ROC is a Trojan horse through which the Russian government conducts “hybrid war” against Ukraine, and through which it also attempts to ‘influence’ first European religious then political organizations. If the new Ukraine thinks it can unwind history and institute religious discrimination – and even persecution – it is completely deluded if its plan is to lobby Europe to follow its lead back into the Dark Ages. Jelena Rakcevic is a freelance journalist, graduating with a Masters in International Relations from the University of Montenegro in 2013. Her reports have been published by EurasiaReview.com, ModernDiplomacy.eu and other digital media.